Fuel Costs Add Up. Get Better Fuel Discounts. At Apex, we work hard to make sure truck drivers and trucking companies can save the most on fuel when using the Apex Fuel Discount Program. We also have great fuel management tools designed to make sure you’re getting the most out of your fuel card. Average $0.30 Per Gallon Savings at in-network locations. Secure access to your account and card management online. $0 transaction fee on in-network fuel purchases. Find the best discounts with the Apex Fuel Finder. Protect your cash flow with a fuel credit line for those who qualify. 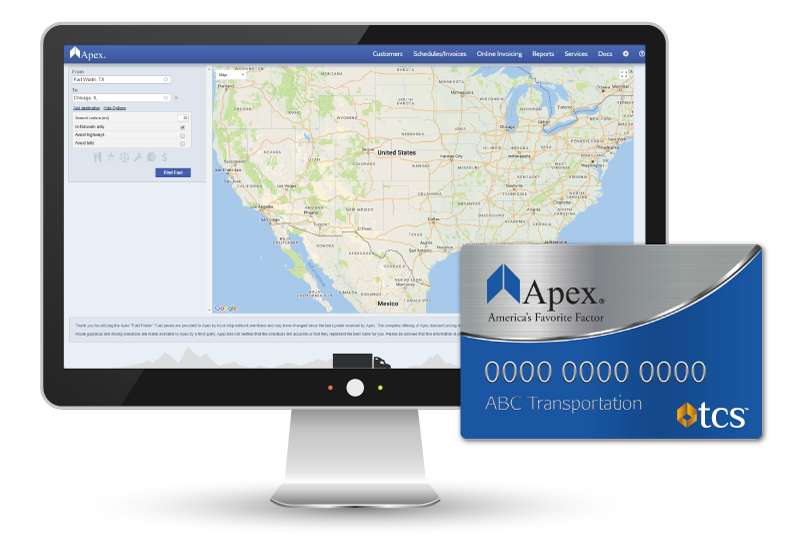 The Apex Fuel Card runs on the robust and industry renowned TCS EFS and TCS Comdata fuel card platforms giving you the power to choose which program works best for your trucking company. Get your Apex Fuel Card and start saving today.